← Where can I learn more about NAV analysis reports and analysis by dimensions? The perpetual problem of the new NAV user is when you get started in a new area of the application, there are way too many options to choose from. How many times have you opened up a new form, only to find twenty or more columns displayed as the default, and many more lurking behind the show columns menu? While we appreciate having all options for all people at some point, new users can find this especially daunting when trying to just get started with something new. I’ll show you which columns to choose in the row setup for account schedules as a beginning point, and go through some simple explanations of how they are used. Row No. – The row number is completely optional, but highly recommended. This simple element of the row setup will eventually be one of the key features of your account schedule, allowing you to calculate and organize with ease. Description – This is the one place you have to communicate, in words, what you’re showing on each line of your report. Totaling Type: Posting Accounts or Formula – This field tells NAV what you’re going to do here. You’re either going to pull data from your general ledger posting accounts or calculate a formula. Totaling – Which general ledger accounts you want to pull or what formula you want to calculate. Row Type: Net Change or Balance at Date – The key here is knowing what type of accounts you’re reporting on. 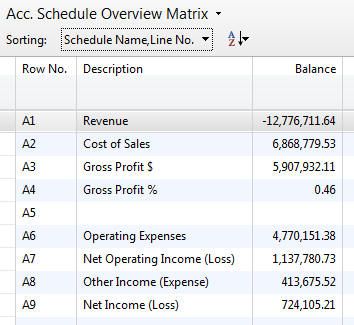 If you’re using income statement accounts (Revenue/Expense), then you need to use net change. If you’re using balance sheet accounts (assets/liabilities), then you need to use Balance at Date. 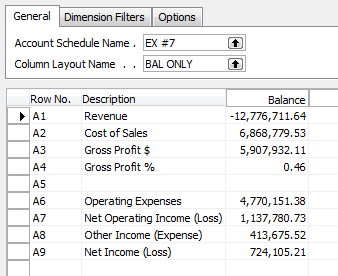 Shown below are both the design view and the user view of a summarized income statement, showing the use of these five options.